WASHINGTON, D.C. (AP) — Concerned about rising reports of close calls and safety risks involving drones, the government announced Monday it will require many of the increasingly popular unmanned aircraft to be registered. Pilot sightings of drones have doubled since last year, including near manned airplanes and at major sporting events, and there are reports of interference with wildfire-fighting operations, Transportation Secretary Anthony Foxx said at a news conference. The FAA now receives about 100 reports a month from pilots who say they’ve seen drones flying near planes and airports, compared with only a few sightings per month last year. So far there have been no accidents, but agency officials have said they’re concerned that a drone weighing only a few pounds might cause serious damage if it is sucked into an engine or smashes into an airliner’s windshield. Toys and small drones that don’t present a safety threat are likely to be exempt from the requirement. Drones that weigh only a pound or two or that can’t fly higher than a few hundred feet are considered less risky, but heavier ones and those that can fly thousands of feet pose more of a problem. To work out details, the FAA and the Transportation Department are setting up a task force including government and industry officials, pilots and hobbyists. They’ll recommend which drones should be required to register. It’s hard to identify drones seen operating illegally near airports and planes or over crowds, and registration by itself won’t change that. But it would allow the FAA to identify drones when they can be recovered after landing or crashing, a common occurrence. Earlier this year, drones operated illegally crashed on the White House lawn and at the New York stadium where the U.S. Open Tennis Championships were being held. In both cases the drone operators came forward. But if they hadn’t, the government would have had no way to identify them. “There can be no accountability if the person breaking the rules can’t be identified,” Foxx said. There’s no official count of how many drones have been sold in the U.S., but industry officials say it is in the hundreds of thousands and will easily pass a million by the end of the year. 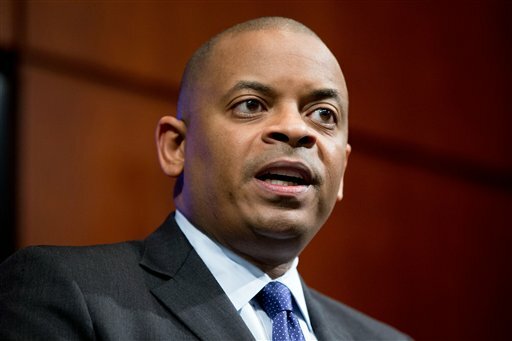 Foxx said he has directed the task force to deliver its report by Nov. 20 and hopes to have registration requirements in place by mid-December. The timeline is tight, but the urgency of the problem demands swift action, he said. The Consumer Electronics Association predicts that 700,000 drones will be sold this holiday season, and Foxx said it’s especially important that new drone users be taught the responsibilities that come with flying. Regulations devised by the task force “will have long-term implications for free speech, privacy and the commercial development and deployment of this nascent technology,” he said in a statement. Foxx was vague when asked about the FAA’s authority to require registrations, especially on an expedited basis that will provide little if any opportunity for public comment first. It typically takes the agency years to put new regulations in place. Also, a 2012 aviation law includes a provision exempting the model academy’s 180,000 members from drone regulations. Jim Williams, a principal at the law firm Dentons who formerly headed the FAA’s drone office, said he believes the agency can get around having to go through the cumbersome rulemaking process by formally determining small drones are a new type of aircraft and therefore fall under existing FAA regulations that say all aircraft must be registered. “I don’t think there is any way they could realistically get through the rulemaking process by Christmas,” Williams said. The Air Line Pilots Association and members of Congress have been calling for drone registration. “This is a simple and necessary tactic to immediately identify the owner and drive home” the importance of safety rules, said Tim Canoll, president of the pilots union. There is virtually no difference between model aircraft and the drones used by many commercial operators. Model aircraft also vary widely in size, weight and capability. Some are larger than the 55 pounds that the FAA uses to define small drones and can fly thousands of feet high.